That’s right readers, the console timeline as you know it has been rewritten. E.T. – copies buried in the desert? Check. Made-up technical jargon like “super-real photoanalytic gouraudalising polygons”? Of course. Jokes about “waggling your joystick” and “playing with yourself”? Check. However, as the Exhumed voiceover guy says, something has gone terribly wrong. At 1990 in the gaming timeline presented by renowned gaming journalist “some cockney guy from MTV”, the Mega Drive was praised to high heaven. It was “beefier [than the SNES], with more hard-hitting arcade ports”. Good, – this is accurate, although SNES did have some good ports from Konami, Taito and so on. “In 1995 Sony released their PlayStation, with amazing games like [Insert titles of 3D games here], gaming would never be the same again. Then, in 1997, Nintendo released their Nintendo 64. Blah blah Mario 64 blah blah GoldenEye. Cartridges blah 3D blah. Quite apart from the Dreamcast looking nothing like any piece of kitchen equipment EVER – what was he getting at? Does it look like his cooker? A pair of scales? The sink? – we’re sort of missing something out here. It’s that little guy to the right there. 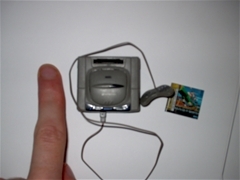 I know it’s small because it’s only a model, but that, there, is the Sega Saturn. Just because it wasn’t a huge success doesn’t mean it should be written out of history. It gave birth to some of the greatest games of all time and, worldwide at least, hardly gave Sony the clear playing field that lots of people think they had. Of course I’m being very selective here. They also missed out the Amiga CD32, the CDi, the NeoGeo and, I’ve just realised, the GameBoy, although perhaps these were covered in a separate segment – I switched off in outrage after realising there was no Saturn. Games on TV – getting worse. An even worse abuse of videogames on TV was evident in the programme “Don’t Make Me Angry” this week, in which some lad with anger management issues was offered the chance to pitch a game idea to Ubisoft. Er, come again? How come Capcom’s name is all over the Resident Evil games? I can imagine the researcher or presenter asked Ubisoft a few questions. Presenter: So what games have you made then? Ubisoft: Well, we did Rayman, Peter Jackson’s King Kong and Beyond Good and Evil. P (writing notes): … and Resident Evil. Great, thanks. U: No no, Beyond Good and Evil. P: Yeah, Resident Evil. That’s a game. You make games. You made Resident Evil. In the end the angry boy didn’t even sketch or write anything down before getting the once-in-a-lifetime chance – he was on the Eurostar to Paris (you know, on his way to visit UBISOFT) and just had a blank sheet of paper. The word that springs to mind is “ungrateful“. Following the absolutely abysmal “report” about games on the ITN news this week – in which a presenter pretended to be a character in a 16-bit platformer ON THE NEWS – I was going to make a post about why games, in fact, shouldn’t be allowed on TV, not even if they’re made by people who know what they’re doing. By comparison, my own videos seem totally winning. Tell me what you think about games on TV, the Saturn and so on underneath. I’ m listening to Gateway To Your Dreams, from NiGHTS Into Dreams [Sega Saturn] by Sonic Team. Yes, it DID exist, DAVE BERRY. Sony invented the third dimension. It’s likely that they didn’t mention the Saturn because most of the people who watch these shows wouldn’t know about it. There weren’t really a lot of mass market games for the Saturn either. Everyone’s heard of Mario, but there was never a “proper” Sonic game for the Saturn. Games like SF3 and NiGHTS may be excellent, but they were never going to get the same kind of attention, especially with Sega’s excellent advertising. I’m not sure what item in my kitchen looks like a Dreamcast though. Perhaps he meant the PS3.